Ann Marie Braca, newly named principal of Waldron Mercy Academy. Ann Marie Braca has been named principal of Waldron Mercy Academy, the school’s Board of Trustees announced March 28. Braca will become the 11th principal of the school in Merion Station when she takes the reigns July 1. Founded in 1923, Waldron Mercy today educates some 495 students in grades Kindergarten through eight, plus pre-K early childhood education. It has a faculty of approximately 50. Braca will succeed Principal Nell Stetser, who concludes her 27-year career at the school. Waldron Mercy board chair Kimberly Baxter said Braca was chosen over several candidates particularly because of her accomplishments in curriculum development for all grade levels. 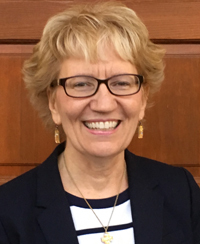 “We think her distributed leadership approach will continue to empower Waldron Mercy faculty and staff who are highly regarded for their ability to engage students in learning. Ann Marie’s personal experience with Mercy education truly make her a perfect fit for Waldron Mercy Academy,” Baxter said. Since 2009, Braca has been principal of Holy Family Regional School in Phoenixville, Chester County, which is a consolidation of several parish elementary schools in the area. Braca improved students’ results on standardized tests and led the school through its Middle States reaccreditation. She updated Holy Family’s computer lab and equipped students with mobile technology appropriate for each grade level. She also enhanced service learning experiences for students. Under Braca’s leadership Holy Family Regional eliminated its debt and now has a balanced budget along with capital funds. The school also raised money to provide more scholarships to students. During her tenure, Holy Family earned the National Blue Ribbon School of Excellence, an honor also bestowed twice on Waldron Mercy Academy. Braca’s two daughters graduated from Gwynedd Mercy Academy High School where she also donated more than a decade of her talent and time as a volunteer for the school’s theater department. “I truly appreciate the confidence Waldron Mercy Academy’s board has placed in me,” Braca said. “Based on my personal experience, I value how students and their families benefit from more than a superior academic education in a Mercy-sponsored school. Since 2010, Braca demonstrated her commitment to making Catholic education available to more children through her volunteer service on the Board for the Foundation for Catholic Education and on the Chester County Advisory Council for Catholic Education. Braca earned a Master of Science in education from Gwynedd Mercy University and her bachelor’s degree from Villanova University.